The induction of tissue-localized virus-specific CD8 T-cell response is essential for the development of an effective therapeutic vaccine against genital diseases, such as cervical cancer and genital herpes. Here, we aimed to elucidate the immunologic role of IL7 in the induction of mucosal cellular immunity. IL7 was engineered through Fc fusion to enhance mucosal delivery across the genital epithelial barrier. The immunomodulatory role of IL7 was evaluated by monitoring the kinetics of various immune cells and measuring the expression of chemokines and cytokines after intravaginal administration of Fc-fused IL7 (IL7-Fc). 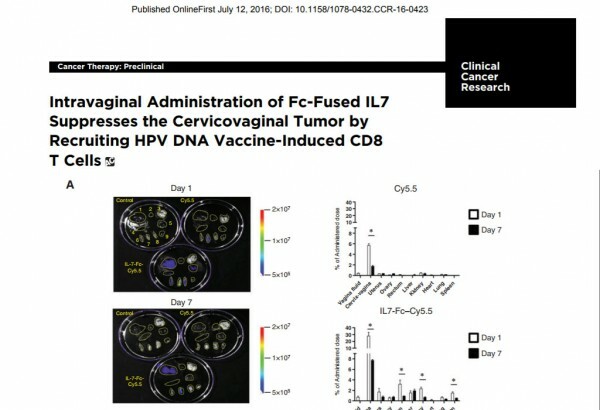 The antitumor effects of intramuscular human papillomavirus (HPV) DNA vaccine or topical IL7-Fc alone or in a combinational regimen on mice survival were compared using a orthotopic cervical cancer model. Intravaginal treatment of IL7-Fc, but not native IL7, induces upregulation of chemokines (CXCL10, CCL3, CCL4, and CCL5), cytokines (IFNγ, TNFα, IL6, and IL1β), and an adhesion molecule (VCAM-1) in the genital tract, leading to the recruitment of several leukocytes, including CD4, CD8, γδ T cells, and dendritic cells. Importantly, in this murine cervical cancer model, topical administration of IL7-Fc after intramuscular HPV DNA vaccination increases the number of HPV-specific CD8 T cells in the genital mucosa, but not in the spleen, leading to stronger antitumor activity than the HPV DNA vaccine alone. Our findings provide an important insight into the immunomodulatory role of IL7-Fc via topical application and the design of therapeutic vaccine regimen that induces effective genital-mucosal CD8 T-cell responses. 다음글Modulation of gut microbiota and delayed immunosenescence as a result of syringaresinol consumption in middle-aged mice.